A while ago I was contacted to place a link to Alpha Phonics as a resource. Being that I only want to ever promote or advertise something I truly and really love and whole heartedly stand behind, I was not willing to do so until I had had a chance to check it out for myself and see what I thought of it. David, from Alpha Phonics, graciously mailed me the book and CD (again, thank you David!). We’ve been using it for a couple of weeks now and I am so totally LOVING the book! I have two three year olds. They fairly recently turned three so they are really really young and I honestly didn’t expect much when we started. Both my girls know how to phonetically sound out all of the alphabet letters. They’ve been sounding out letters for some time now and we recently put up some large ABC magnets on the fridge for them to play with. I also read to them quite a lot and they absolutely love to try to put letters together and ask us what it says. Since they seem to be really interested in forming words and get that several letters together will actually form a word, I figured it couldn’t hurt to try Alpha Phonics with my girls and see what happens. I’m going at a much slower pace than is recommended in the book. We go back and review previous lessons because they are so young and they get such joy out of getting the words sounded out correctly. I am in AWE! Absolute awe! The oldest twin is reading two and three word sentences. She is always begging to read from the “big red book” and constantly asks to do more. I am going at her pace and letting her be the one to tell me how much she wants to do. My younger twin girl listens in to her sisters reading and she also asks to read but doesn’t seem as interested, which is totally fine! She is, after all, only three! The other day I was doing the lesson with the older twin and she was stumped on one of the words. My youngest pipes in and reads the word trying to help her sister! I was shocked! So I guess she is soaking it in and is learning right along with her sister. 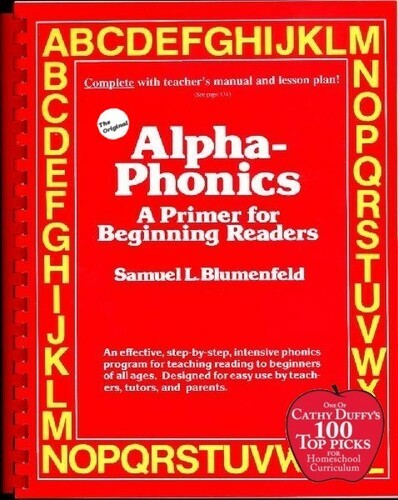 I am truly impressed with Alpha Phonics and highly recommend this book! I absolutely love that it is a no frills book. You’ll find no pictures or fancy drawings. It is very simple, very short lessons, perfect for little ones with short attention spans. I definitely plan on sticking with this book and have been using it every day with both my little ones. There is also a CD that this book comes with -it’s perfect in that it is just like the book -no pictures and animated images to distract the child from learning to read. It’s short and easy lessons just as in the book. I can see us eventually using the CD since we very much love incorporating the computer in our children’s education. As an aside and example of the customer service of Alpha Phonics, the first CD we received didn’t work- we had tried it in several computers and it just wouldn’t do anything. I emailed David about this and he had a replacement shipped just 2 days later, so great customer service! It is truly an amazing feeling to see your little ones reading! And it makes me feel so good that I am the one that is able to teach them with the aid of this wonderful book. When it comes to educating our children, sometimes it can feel really quite scary. The doubts on whether we, as parents, can really do this. Can really teach our kids. Having the right tools goes a long way in giving me the confidence I need to teach my girls. This book, in turn, gives my girls the confidence they need, especially when they find themselves succeeding in reading! Nothing like seeing the sparkle in my girls eyes when they realize they are reading like their big sister! Thank you Alpha Phonics!! Each of my girls give this TWO thumbs up! Alpha Phonics sent me the book and CD to review. All of the opinions expressed here are my own. I like the idea of kanban the viausl is good for me and I might just enjoy using it this school year with my boys. I have a 5th grader and an 11th grader. Do your children do a lot of independent work? this year my 5th grader will have a computer oriented math and language course so I’m hoping those subjects will be his independent subjects [the math has a problem by problem solution solver]. Do your children read independently? My 5th grade hates reading and I always have to read with him or to him to get through all the reading that is required.